Doug has been helping people reach their fitness goals since 1991. Doug is currently a certified personal trainer with ACSM, ACE, and the NSCA. He is certified as a kettlebell instructor through the Russian Kettlebell Certification (RKC), a level 1 and small group instructor with the TRX suspension system, a Dynamic Variable Resistance Training (DVRT) certified coach, and a certified professional in the Functional Movement Screen system (FMS). Doug is certified with Precision Nutrition as a level 1 coach. The International Dance and Exercise Association (IDEA) awarded Doug the distinction of “Master Trainer” in 2005. In 2015 Doug was selected from hundreds of trainers nationally and awarded 3rd place in the Men’s Health Next Top Trainer competition. In 2016 Doug was runner-up in the NSCA Personal Trainer of the Year. As a competitive bodybuilder, he reached a pinnacle in his amateur career when he won the 1998 NPC Junior National Championships as a light-heavyweight. Doug has trained professionals of the NFL, USTA, and PGA. He currently is the Nevada state director (SPD) for the National Strength and Conditioning Association (NSCA) and has also spoken at multiple NSCA events. 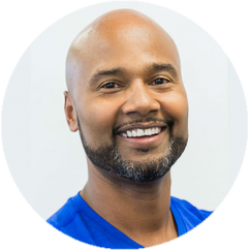 He has been a featured speaker for the Professional Fitness Institute in Las Vegas a division of Pinnacle Career Institute. In 2015, Doug fulfilled a lifelong dream and opened the J & D Fitness Personal Training Studio in Las Vegas. Along with running a successful training studio, Doug currently consults and lectures on tactics on how to successfully operate a training studio. Doug and his wife, Judy, relocated to Las Vegas in 2003. In a brief period, they were able to establish J & D Fitness Group as the leading personal training company in Southern Nevada. Doug has been featured on TV, radio, and in news articles several times as an expert in the fitness industry. Doug owes much of his success in personal training to his educational background and years of experience. As a seasoned personal trainer, Doug lives by the mantra that it’s not what you know, but rather, what you can coach.